How many of you out there are preparing for back to school? I know, I know. It is only July, but summer is flying by and before you know it it will be time for school shopping. So, if you have a shop you might want to start getting ready now. I know I am! I've been designing some new ear warmer and headband patterns and I can't wait to share them with you all! This pattern is for a shell stitch turban headband. I made mine with cotton. If you are going to use acrylic I would suggest one that isn't too thick. I like to use Red Heart With Love often, but it was just a little too bulky to give this headband the delicate look I was going for. So, you may want to skip the RHWL for this one. This pattern is a one size fits most. It should fit most adults. The shell stitch I'm using is in multiples of 6 (plus 2), so you may adjust your sizing that way or just change your hook size. I have a head circumference of 23 inches (I know, I have a big ol' bean!) and this headband fits me perfectly with stretch. You can also add rows on to make it wider if you wish. It's a versatile pattern and easy to work with. Also, note that the second round will be worked on the opposite side of the chain from the first round. It is the only round worked this way. As always, feel free to sell anything you make from my patterns, but you may not sell or distribute my patterns, or claim them as your own. Share the link to this post anywhere you want and as often as you want. I also ask that you use your own photos to represent your work. R2- For this row you will work on the opposite side of your starting chain. Each stitch will be directly opposite of the stitch on the other side. Make 1 SC in the same stitch as the last SC of row 1. *Skip 2 stitches. Shell in the same stitch as shell on opposite side. Skip 2 stitches. SC in same stitch as SC on opposite side. * Repeat from *to*. *Note that what you have facing you will be referred to as the right side of the piece. It's important for R5 that you know what side is the right side. Also, you will no longer be working around, but you will be turning the piece. R3- Turn. Chain 1. SC in first stitch. *Skip 2 stitches. Shell in ch 1 space of shell from previous row. Skip 2 stitches. 1 SC in next stitch (your SC from previous row.). * Repeat from *to*. R4- Repeat row 3. Finish off. Now you will going back to finish the other side of the headband. Make sure the right side is facing away from you. 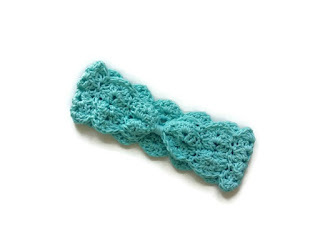 This is so the two sides of the headband will mirror each other. R5- Join yarn in the last SC from row 1. Chain 1. SC in same stitch as joining. *Skip 2 stitches. Shell in chain 1 space of shell from row 1. Skip 2 stitches. SC in next stitch (SC from row 1). * Repeat from *to*. R6- Turn. Chain 1. SC in first stitch. *Skip 2 stitches. Shell in ch 1 space of shell from previous row. Skip 2 stitches. SC in next stitch. * Repeat from *to*. Finish off leaving a long tail to sew the two ends together and wrap around to make the headband into a turban style headband. And there you have it. 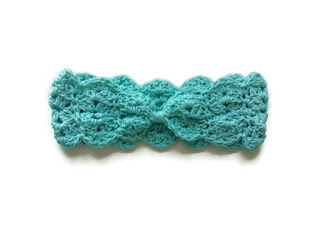 A lacy turban style headband. I hope you love it! Feel free to share your work from my patterns on my Facebook page! I love seeing what you guys create from my patterns! Share here.